From first observation to final inspection, utility pole inspection is a vital part of successful field management. So what really happens out there during an equipment assessment? In this post, we talk about line inspections, referencing F, for an all-important forty inches. One of the most common violations we encounter involves line clearances as specified in the National Electric Safety Code (NESC). During an NESC line inspection, a measurement is taken of the distance between the highest communication line and the power neutral or lowest power line. The clearance the NESC requires is at least forty inches. This space, a bit more than the length of a yardstick, serves a very important purpose and any reduction in the prescribed clearance can cause major safety issues. According to one of our experienced technicians, problems arise when performing maintenance or repair work without adequate working space and separation from live power lines. For instance, when a power main or drip loop is in the communication space, it can “place a communication technician at risk in the making of needed repairs that he or she is there to complete." Beyond the existence of proper clearances, NESC inspections are designed to determine the structural soundness of the entire pole structure taking into consideration the overall height and the number of attached lines or other structures being supported. Based on that data and actual testing of the pole density, an assessment of overall pole strength and structural integrity can be made resulting in the replacement of poles which do not meet structural standards. Aside from the 40-inch measurement, technicians are also concerned with a variety of other clearances during utility pole inspections, including midspan clearances over roads (15.5 feet). 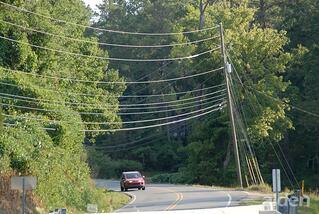 Telecom cables must remain 30 inches from power wires (including neutrals) at the mid span. At the pole, telecom equipment must be more than 8 feet from the ground. Like the 40-inch rule, these items all speak to public safety issues. Cars or trucks striking low-hanging wires over roads or side streets are situations that can be prevented by the enforcement of NESC clearances. Low wires can also cause dangerous temptation as a place to climb, which could result both in personal injury and damage to utility facilities. G for Greater Than. At this point in the inspection, after minimum clearance measurements have been assessed, two more will be checked: the space between mid-span lines that run to the next pole (minimum distance must be thirty inches), and between communication drop lines running parallel to a power drop line (the drops must be at least 12 inches apart). Next week, we will tackle the numbers that go with this vital letter.